On March 13, Sara Oliphant gave birth to naturally conceived triplets at St Vincent’s Private Hospital Melbourne, 1 girl and 2 boys, Indianah, Brooklyn and Jacoby. 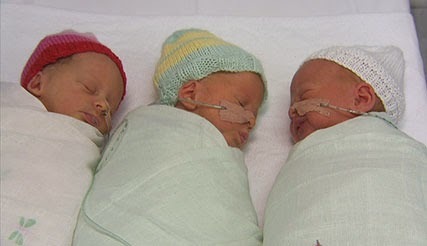 After 2 weeks in the Special Care nursery, all 3 healthy babies were taken home from hospital this week. Sara grew up in Helensburgh attending Holy Cross School then Heathcote High. While at primary school, Sara won a competition to design The War Memorial in Charles Harper Park. Two years ago, Sara moved to Melbourne with her partner Brodie. They have a son Isaiah, now 14 months old. Dave & Kathy Oliphant are very proud grandparents.